How do I get the entire class involved... with Shakespeare? 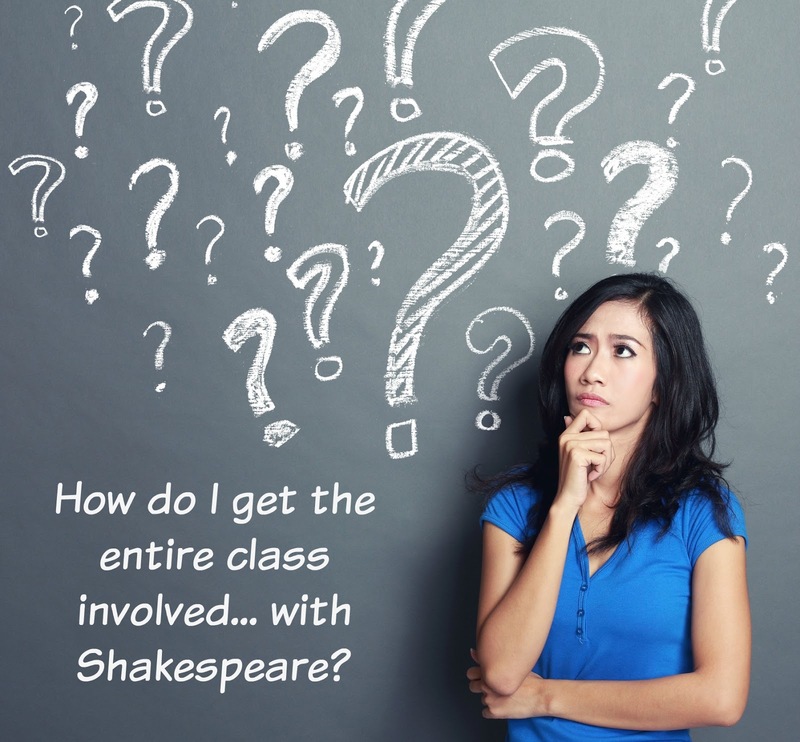 GET YOUR STUDENTS INVOLVED WITH SHAKESPEARE! Last semester I was explaining to a colleague that I teach Great Speeches at the beginning of the semester as a way to engage my students in Higher Order Thinking, Close Reading, and Textual Analysis. You will find my blog post about this idea here: ENGAGE YOUR STUDENTS FROM DAY ONE! I explained to Anne that my students were marking up the text and answering questions but they still seemed to be somewhat disengaged. Anne suggested that I break up the speech into small parts and have groups of two or three students focus on only a few words. Each group defines any unknown words and gets ready to explain their section to the class. She then suggested we read the speech together with each group reading, and explaining, their section to the class. So simple yet so effective! They knew the speech better than any previous class and seemed to enjoy working on it. Some read their section with bravado, but others read it in their normal voices. In this case we were reading the Saint Crispin's Day Speech, so once we were done I played Kenneth Branagh's version - they understood it, all of it, right away. I did pass out a copy of the speech the week before the class and asked them to read it through. I didn’t say what we were going to do with the assignment and reminded them not to use any outside sources - simply to read it and mark it up if they wish. I think this read through can be done as a segue into any play as a reminder that they can understand Shakespeare - pretty easily - if they break it down.